Finlandia Hall is located in a park on Töölönlahti Bay in the centre of Helsinki, not far from main bus and railways stations and easily accessed from Helsinki Airport. Tram and bus stops can be found right in front of the building, and we are only a short walk from the city centre. Visitors are also welcome to use the car parks near Finlandia Hall. You can find us at Mannerheimintie 13 e, 00100 Helsinki. Trams 4, 7, and 10 stop on Mannerheimintie in front of Finlandia Hall (National Museum stop). 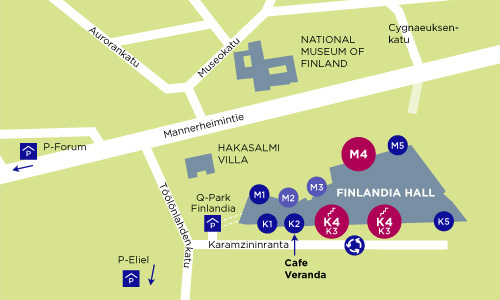 Q-Park Finlandia is located nearby and connected to Finlandia Hall by an underground walkway during Finlandia Hall’s opening hours. The entrance to the car park is on Karamzininranta. Parking charges apply and the 650-space facility is operated by Q-Park.